Wasting you grimly but breaking the hurdle down. And this man wins in the end. Smith’s attack on the right quickly bogged down, his men being funneled through two ravines where they were cut down in large numbers. Wright’s men in the middle, still weary from their attacks on June 1, made little effort, and their attack was pinned down almost as soon as it started. 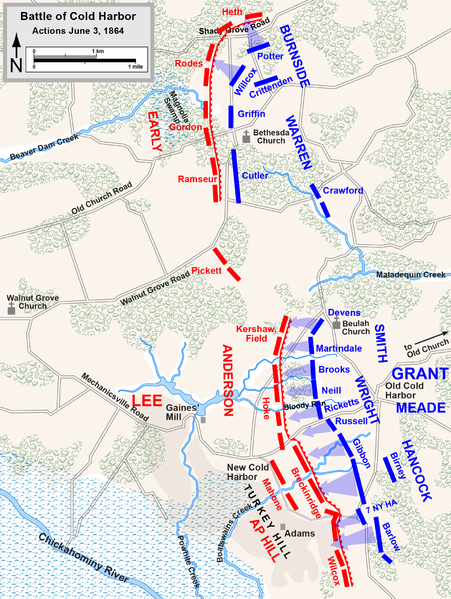 Hancock’s attack on the Union far left pierced the Confederate lines, but the breach was sealed and the Confederates repulsed Hancock with heavy loss. The attacks were all over by 7:30 AM. Grant wanted attacks to resume, but by 12:30 PM he had become convinced that further attacks were simply impossible.